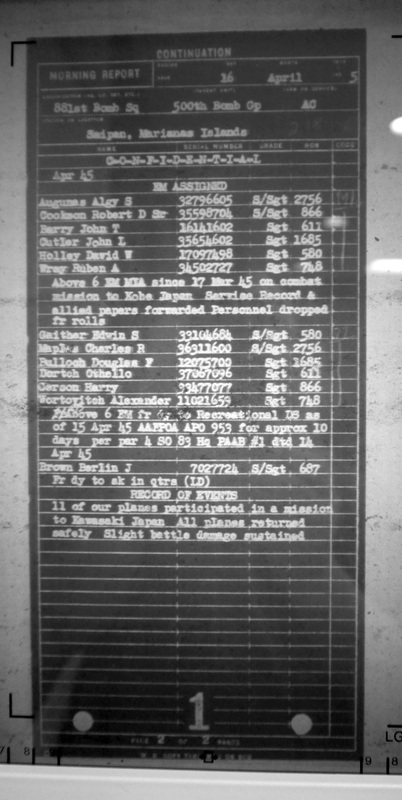 Thirty days after the loss of our uncle's aircraft, the Z Square 8, the Fitzgerald crew was still listed as MIA on the 881st Bomb Squadron Morning Report. 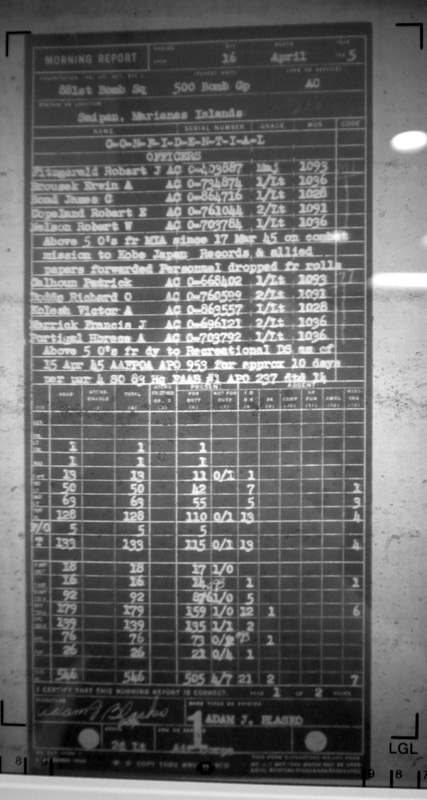 Interestingly, our uncle's original crew on the Z Square 6 is also listed directly below that, indicating that that crew (Calhoun) was going to Hawaii for recreational leave. Major Fitzgerald for his crew on the Z Square 8 the previous December, 1944, Uncle Bob would not only have been going on leave to Hawaii, he would have survived the war with his buddies on the Z Square 6. SSgt Robert D. Cookson, Sr., 22, of 420 Cross street, Uhrichsville, radar operator on a B-29, has been missing since a bombing raid over Japan March 17, his wife and family were notified by the war department yesterday. Sgt. Cookson, who already has at least 12 major missions to his credit was based at Saipan. He received his training at Scott Field, Ill, Boca Raton, Fla., Walker Army Air Field, Kansas. He entered the service Jan. 21, 1943, and went overseas last November 10. His parents are Mr. and Mrs. Russell Cookson of Goshen and his wife is the former Daisy Frances. They have three children. He also has two sisters, Eileen and Jane, both at home, and one brother, PFC Richard Cookson, who is in Hawaii. Staff Sgt. 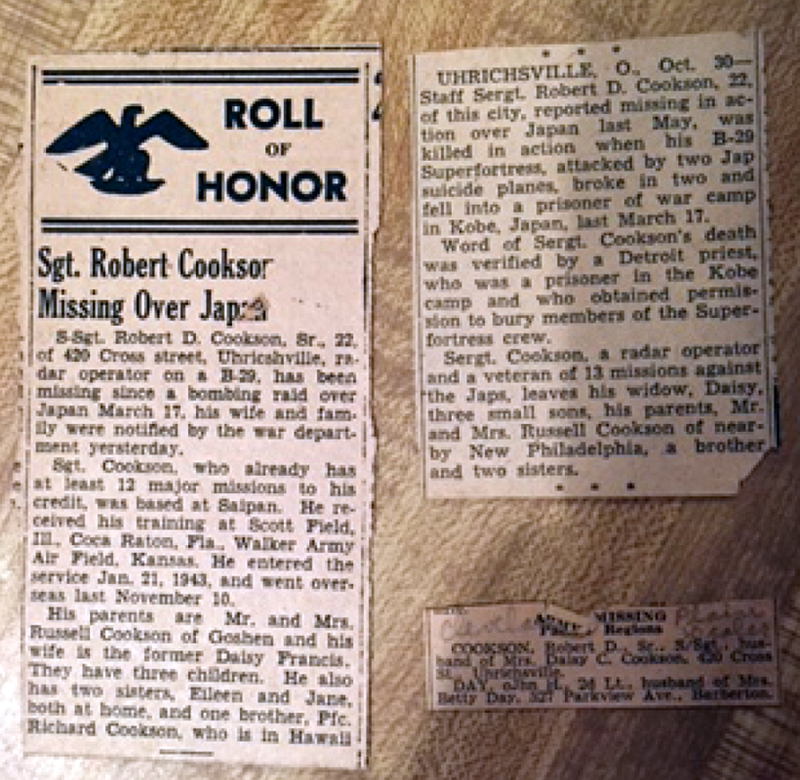 Robert D. Cookson, Sr., 22, of Uhrichsville, who was reported missing in action over Japan last April 12th, was killed in action on March 17th, 1945, according to word received by his wife, Mrs. Daisy Frances Cookson, 420 Cross Street, Uhrichsville, from the War Department. Staff Sgt. Cookson, a radar operator aboard a B-29 Superfortress was instantly killed when his ship was struck by two Jap suicide planes and fell into a prisoner of war camp at Kobe, Japan. Details of the accident were supplied the family by a Detroit priest who was a prisoner of war in the camp. The priest said he secured permission from his captors to bury members of the bomber crew. He said the bomber broke in two pieces and that all but two members of the crew were killed instantly. Sgt. 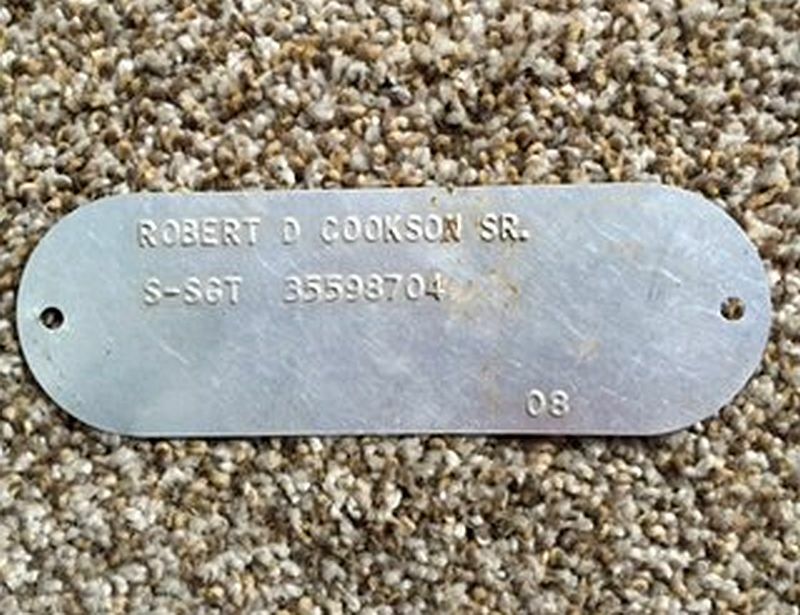 Cookson was born in Rt. 3, this city, where he lived most of his life. At the time of his induction January 21st, 1943, he was employed by the Republic Steel Co., of Massillion. He was graduated from Midvale High School in 1939. In addition to his wife he is survived by his parents, Mr. and Mrs. Russell Cookson of Rt. 3, city; three children, Robert, Jr., Carol Sue and Lois Jean, all at home; a brother Richard Cookson, serving with the U.S. Army on Ie Shima; and two sisters, Misses Jane and Eileen Cookson, both of Rt. 3, this city. 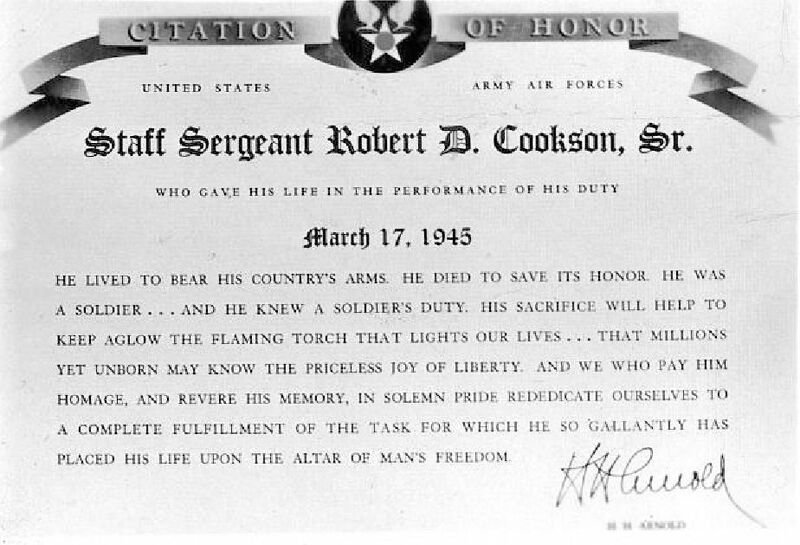 Mrs. Daisy Cookson, 420 Cross Street, Uhrichsville, has received the presidential citation which was awarded posthumously to her husband, SSgt Robert Cookson, who was killed while flying a mission over Kobe, Japan, on March 17,1945. 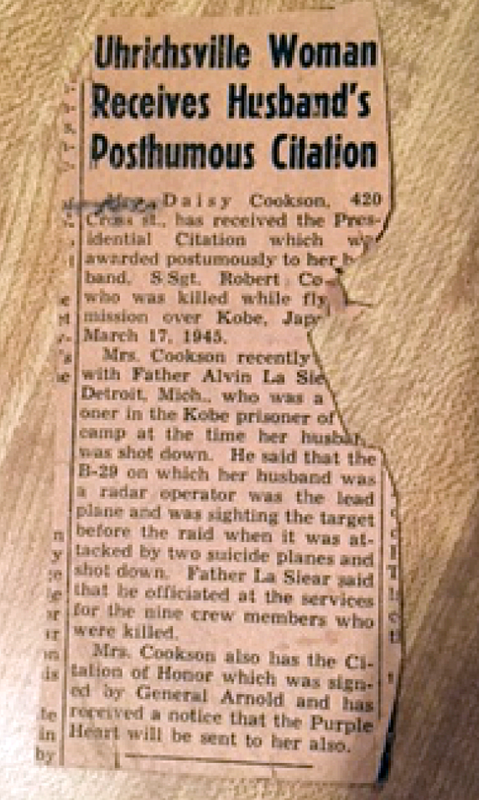 Mrs. Cookson recently talked with Father Alvin Lafier, of Detroit, Mich., who was a prisoner in the Kobe prisoner of war camp at the time her husband was shot down. He said that the B-29 on which her husband was a radar operator was the lead plane and was sighting the target before the raid when it was attacked by two suicide planes and shot down. Father La Siear said that he officiated at the services for the nine crew members who were killed. 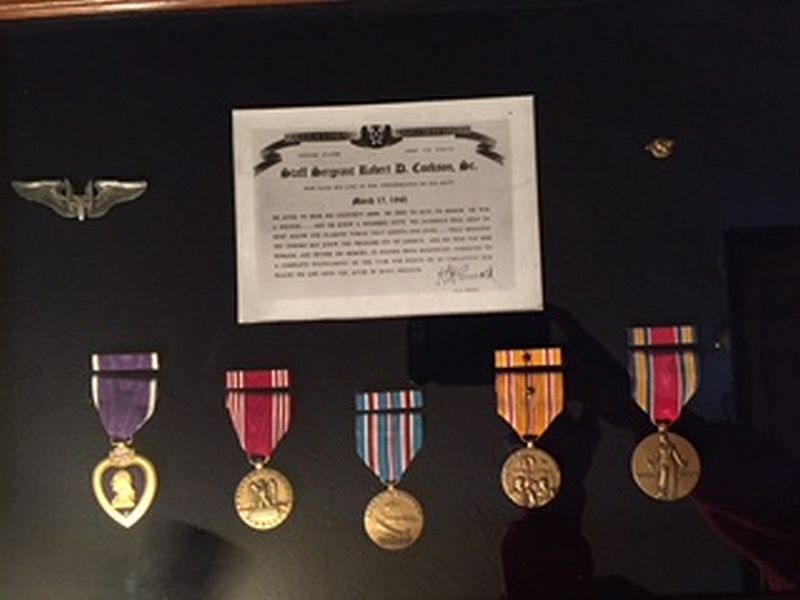 Mrs. Cookson also has a Citation of Honor, which was signed by Gen. Arnold, and has received a notice that the Purple Heart will be sent to her.